Alexei Malakhov/Streeter THE RED AND WHITE: The marching band from North Toronto Collegiate paraded Canadian colours. It was Toronto’s largest parade — ever. And helping the Santa Claus parade set the record on Nov. 18 were participants from local schools, businesses, clubs and multicultural communities. While the star of the show was undoubtedly a visiting out-of-towner (from the far north actually) and many of the marchers had travelled here from across Ontario, a number of familiar faces were also featured in the parade. 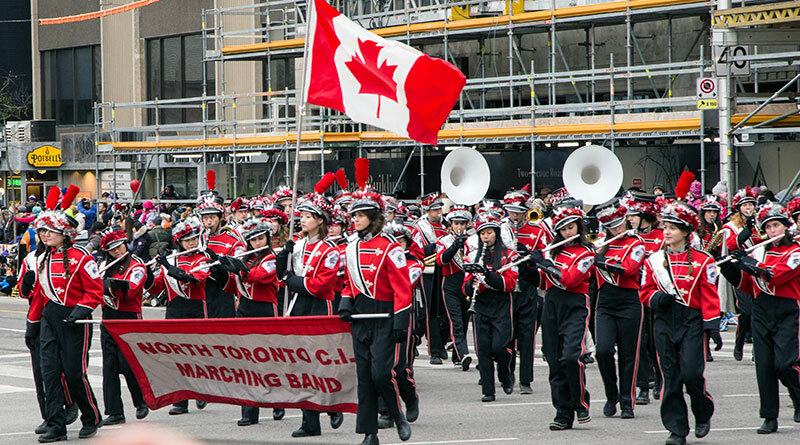 Among the marching bands were musical groups from North Toronto Collegiate Institute in midtown and Malvern Collegiate in The Beach. The 32 floats and 21 bands took three hours to wend its way from Christie Pits, along Bloor Street, down University Avenue, and through parts of Wellington, Yonge and Front streets to the St. Lawrence Market. Bringing up the rear was a wise-cracking Santa atop a huge float holding his sled and reindeer headed by Rudolph. The Toronto Police featured the Malvern Collegiate band in its Twitter feed.